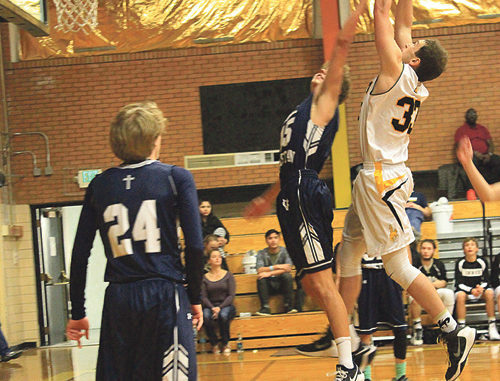 RBC | The Meeker boys’ basketball team increased its record to 9-3, after wins against the Plateau Valley Cowboys and the Vail Christian Saints last week. The Cowboys will not play again until Saturday, when they travel to Vail to play the Vail Mountain Gore Rangers. The Cowboys played last week’s games without their big-man, Zach Dinwiddie, who was out due to a concussion, yet they were able to win both Western Slope League games, beating the Cowboys 47-38 and the Saints 68-58. Meeker led by four at the end of the first quarter and led 26-19 at halftime. The second half was played a lot closer, with the Meeker Cowboys outscoring the Plateau Valley Cowboys by one point each period of the second half. Senior Logan Hughes led his team with a double-double, scoring 15 points and pulling down 16 rebounds. Doak Mantle and Valentin Rosas each finished with seven points, Eli Newman scored six and recorded nine rebounds, while Ryan Phelan scored four, Trapper Merrifield and Kale Burke, each added a basket. Against the Saints, who came in with a 10-1 record, Coach Kindler said his team “played well.” Meeker jumped out to a 17-9 lead at the end of the first quarter and extended it by by at halftime. The Cowboys were outscored by three in the third quarter but came back to outscore the Saints in the fourth and get the Western Slope League win. Newman led the Cowboys with a double-double, scoring 19 points and pulling down 13 rebounds against the Saints. Hughes finished with another double-double, scoring 11 points and 11 rebounds, Mantle also scored 11 points, while Stephen Walsh finished with eight. Merrifield and Rosas both added six, Brennan Jensen added four and Kale Burke added three. The Cowboys will play the Vail Mountain Gore Rangers Saturday in Vail. “Every game from here on out, is important,” Kindler said.